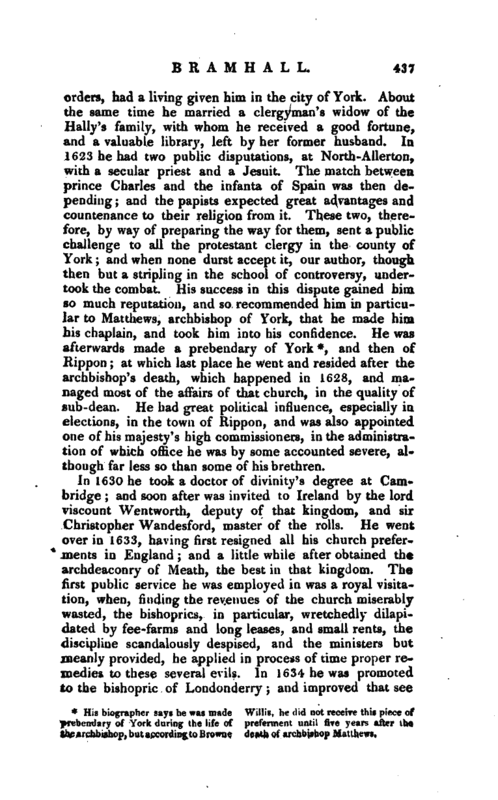 His biographer says he was made prebendary of York during the life of the archbishop, but according to Browne Willis, he did not receive this piece of preferment until five years after the. death of archbishop Matthews. and then pf Rippon; at which last place he went and resided after the archbishop’s death, which happened in 1628, and managed most of the affairs of that church, in the quality of sub-dean. He had great political influence, especially in elections, in the town of Rippon, and was also appointed one of his majesty’s high commissioners, in the administration of which office he was by some accounted severe, although far less so than some of his brethren. In 1630 he took a doctor of divinity’s degree at Cambridge; and soon after was invited to Ireland by the lord viscount Wentworth, deputy of that kingdom, and sir Christopher Wandesford, master of the rolls. He went over in 1633, having first resigned all his church preferments in England; and a little while after obtained the archdeaconry of Meath, the best in that kingdom. 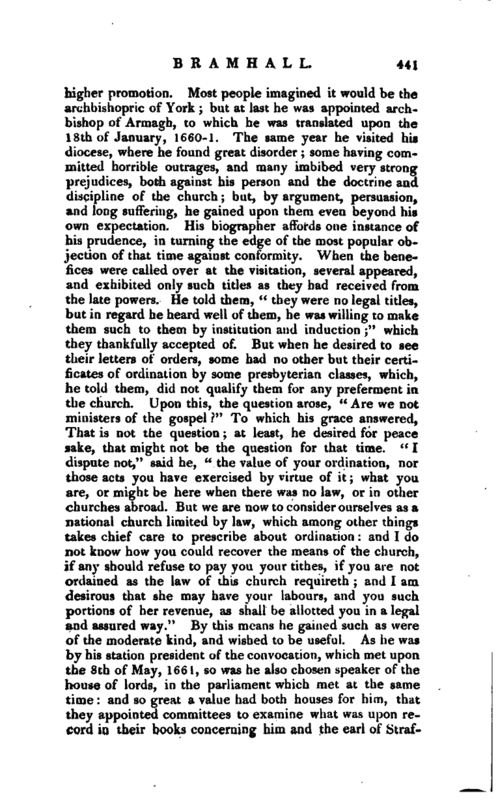 The first public service he was employed in was a royal visitation, when, finding the revenues of the church miserably wasted, the bishoprics, in particular, wretchedly dilapidated by fee-farms and long leases, and small rents, the discipline scandalously despised, and the ministers but meanly provided, he applied in process of time proper remedies to these several evils. In 1634 he was promoted to the bishopric of Londonderry; and improved that see | very much, not only by advancing the rents, but also by recovering lands detained from his predecessors. But the greatest service he did the church of Ireland, was by getting, with the lord deputy’s assistance, several acts passed in the parliament which met in that kingdom on the 14th of July, 1634, for the abolishing fee-farms, recovering impropriations, &c. by which, and other means, he regained to the church, in the space of four years, 30 or 40,000^. a year. 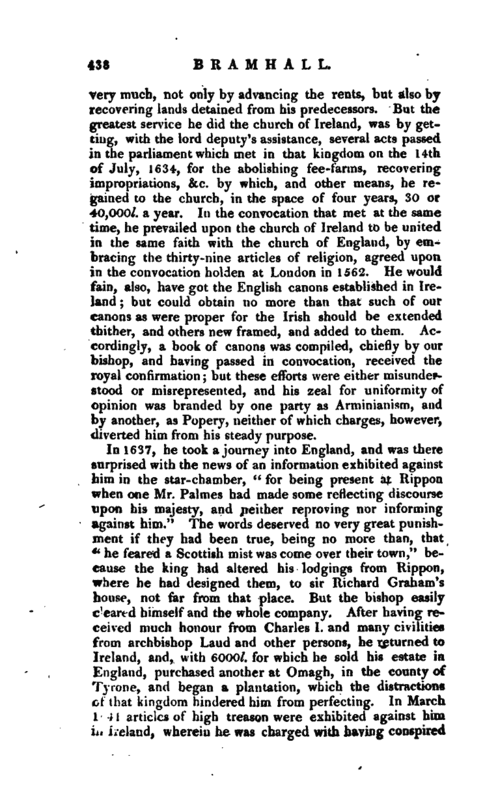 In the convocation that met at the same time, he prevailed upon the church of Ireland to be united in the same faith with the church of England, by embracing the thirty-nine articles of religion, agreed upon in the convocation holden at London in 1562. He would fain, also, have got the English canons established in Ireland; but could obtain no more than that such of our canons as were proper for the Irish should be extended thither, and others new framed, and added to them. Accordingly, a book of canons was compiled, chiefly by our bishop, and having passed in convocation, received the royal confirmation; but these efforts were either misunderstood or misrepresented, and his zeal for uniformity of opinion was branded by one party as Arminianism, and by another, as Popery, neither of which charges, however, diverted him from his steady purpose. In 1637, he took a journey into England, and was there surprised with the news of an information exhibited against him in the star-chamber, “for being present at Rippon when one Mr. Palmes had made some reflecting discourse upon his majesty, and neither reproving nor informing against him.” The words deserved no very great punishment if they had been true, being no more than, that “he feared a Scottish mist was come over their town,” because the king had altered his lodgings from Rippon, where he had designed them, to sir Richard Graham’s house, not far from that place. But the bishop easily cleared himself and the whole company. After having received much honour from Charles 1. and many civilities from archbishop Laud and other persons, he returned to Ireland, and, with 6000l. for which he sold his estate in England, purchased another at Omagh, in the county of Tyrone, and began a plantation, which the distractions of that kingdom hindered him from perfecting. In March 1641 articles of high treason were exhibited against him in Ireland, wherein he was charged with having conspired | with others to subvert the fundamental laws of that kingdom, to introduce an arbitrary and tyrannical government, &c. The bishop was at Londonderry, when he received intelligence of this accusation. All his friends wrote to him to decline the trial; but, thinking it dishonourable to fly, he went directly to Dublin, and was made a close prisoner by the parliament. 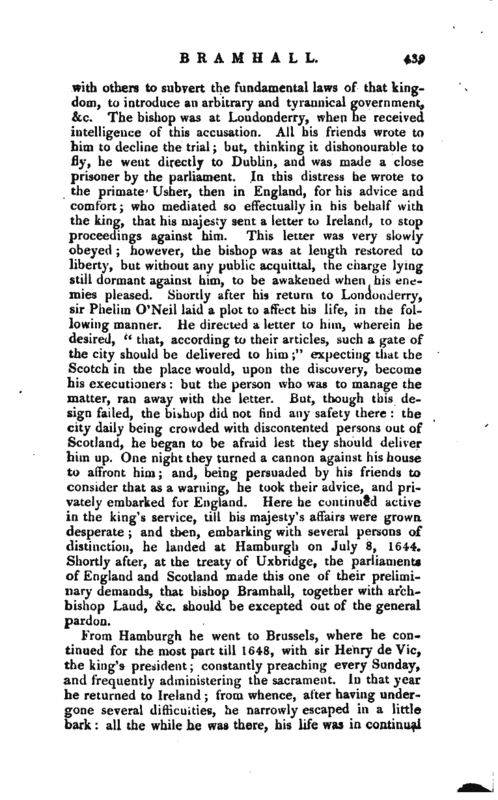 In this distress he wrote to the primate Usher, then in England, for his advice and comfort; who mediated so effectually in his behalf with the king, that his majesty sent a letter to Ireland, to stop proceedings against him. This letter was very slowly obeyed; however, the bishop was at length restored to liberty, but without any public acquittal, the charge lying still dormant against him, to be awakened when his enemies pleased. Shortly after his return to Londonderry, sir Phelim O’Neil laid a plot to affect his life, in the following manner. He directed a letter to him, wherein he desired, “that, according to their articles, such a gate of the city should be delivered to him;” expecting that the Scotch in the place would, upon the discovery, become his executioners: but the person who was to manage the matter, ran away with the letter. But, though this design faded, the bishop did not find any safety there: the city daily being crowded with discontented persons out of Scotland, he began to be afraid lest they should deliver him up. One night they turned a cannon against his house to affront him; and, being persuaded by his friends to consider that as a warning, he took their advice, and privately embarked for England. Here he continued active in the king’s service, till his majesty’s affairs were grown desperate; and then, embarking with several persons of distinction, he landed at Hamburgh on July 8, 1644. Shortly after, at the treaty of Uxbridge, the parliaments of England and Scotland made this one of their preliminary demands, that bishop Bramhall, together with archbishop Laud, &c. should be excepted out of the general pardon. From Hamburgh he went to Brussels, where he continued for the most part till 1648, with sir Henry de Vic, the king’s president; constantly preaching every Sunday, and frequently administering the sacrament. In that year he returned to Ireland; from whence, after having undergone several difficulties, he narrowly escaped in a little bark: all the while he was there, his life was in continual | danger. At Limerick he was threatened with death, if he did not suddenly depart the town. At Portumnagh, indeed, he afterwards enjoyed more freedom, and an allowance of the church service, umler the protection of the marquis of Clanrickard: but, at the revolt of Cork, he had a very narrow deliverance; which deliverance, however, troubled Cromwell so, that he declared he would have given a good sum of money for that Irish Canterburv, as he called him. His escape from Ireland is accounted wonderful: for the vessel he was in was closely chased hy two of the parliament frigates, and when they were come so near, that all hopes of escape vanished, on a sudden the wind sunk into a perfect calm, by which it happened wonderfully that his ship got off, while the frigates were unable to proceed at all. 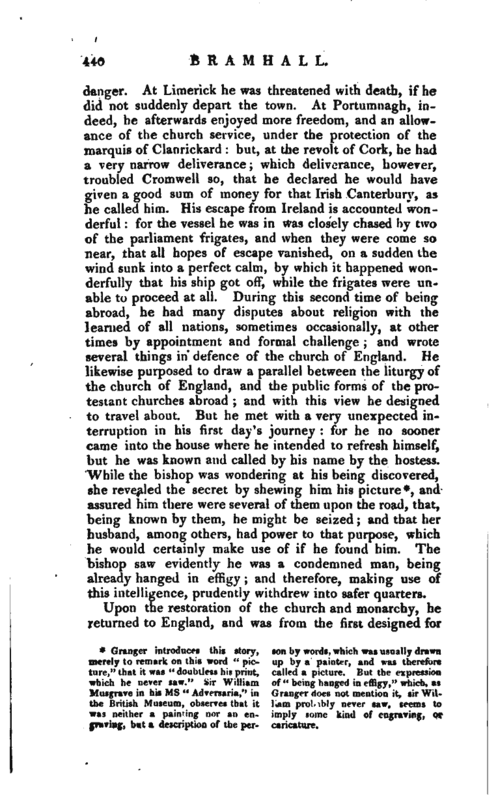 During this second time of being abroad, he had many disputes about religion with the learned of all nations, sometimes occasionally, at other times by appointment and formal challenge; and wrote several things in defence of the church of England. He likewise purposed to draw a parallel between the liturgy of the church of England, and the public forms of the protestant churches abroad; and with this view he designed to travel about. But he met with a very unexpected interruption in his first day’s journey: for he no sooner came into the house where he intended to refresh himself, but he was known and called by his name by the hostess. "While the bishop was wondering at his being discovered, she revealed the secret by shewing him his picture*, and assured him there were several of them upon the road, that, being known by them, he might be seized; and that her husband, among others, had power to that purpose, which he would certainly make use of if he found him. The bishop saw evidently he was a condemned man, being already hanged in effigy; an’d therefore, making use of this intelligence, prudently withdrew into safer quarters. graving, but a description of the per- caricature. | higher promotion. Most people imagined it would be the archbishopric of York; but at last he was appointed archbishop of Armagh, to which he was translated upon the 18th of January, 1660-1. The same year he visited his diocese, where he found great disorder; some having committed horrible outrages; and many imbibed very strong prejudices, both against his person and the doctrine and discipline of the church; but, by argument, persuasion, and long suffering, he gained upon them even beyond his own expectation. His biographer affords one instance of his prudence, in turning the edge of the most popular objection of that time against conformity. When the benefices were called over at the visitation, several appeared, and exhibited only such titles as they had received from the late powers. He told them, “they were no legal titles, but in regard he heard well of them, he was willing to make them such to them by institution and induction;” which they thankfully accepted of. But when he desired to see their letters of orders, some had no other but their certificates of ordination by some presbyterian classes, which, he told them, did not qualify them for any preferment in the church. Upon this, the question arose, “Are we not ministers of the gospel r” To which his grace answered, That is not the question; at least, he desired for peace sake, that might not be the question for that time. “I dispute not,” said he, “the value of your ordination, nor those acts you have exercised by virtue of it; what you are, or might be here when there was no law, or in other churches abroad. But we are now to consider ourselves as a national church limited by law, which among other things takes chief care to prescribe about ordination: and I do not know how you could recover the means of the church, if any should refuse to pay you your tithes, if you are not ordained as the law of this church requireth; and I am desirous that she may have your labours, and you such portions of her revenue, as shall be allotted you in a legal and assured way.” By this means he gained such as were of the moderate kind, and wished to be useful. As he was by his station president of the convocation, which met upon the 8th of May, 166 1, so was he also chosen speaker of the house of lords, in the parliament which met at the same time: and so great a value had both houses for him, that they appointed committees to examine what was upon record in their books concerning him and the earl of | Strafford, and ordered the scandalous charges against them to be torn out, which was accordingly done. In this parliament many advantages were procured, and more designed, for the church, in which he was very industrious. About this time he had a violent sickness, being a second fit of the palsy, which was very near putting an end to his life; but he recovered. A little before his death, he visited his diocese; and having provided for the repair of his cathedral, and other affairs suitable to his pastoral office, he returned to Dublin about the middle of May 1663. The latter end of June, he was seized with a third fit of the palsy; of which he soon died, being then 70 years old. 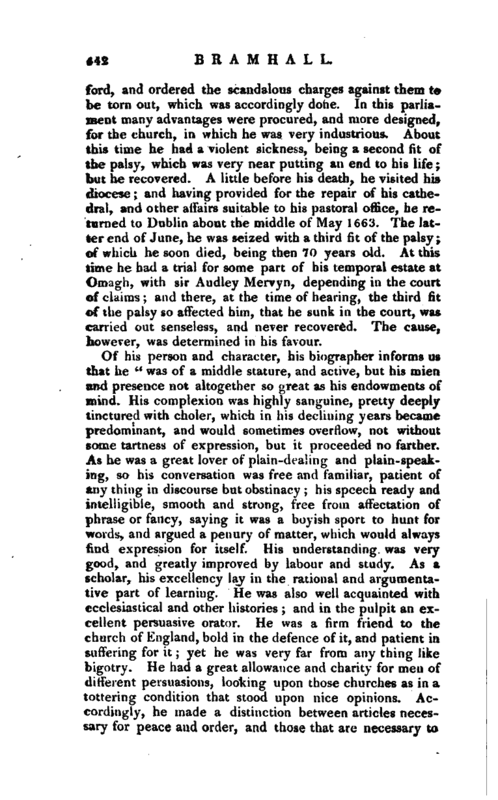 At this time he had a trial for some part of his temporal estate at Omagh, with sir Audley Mervyn, depending in the court of claims; and there, at the time of hearing, the third fit of the palsy so affected him, that he sunk in the court, was carried out senseless, and never recovered. The cause, however, was determined in his favour. Life prefixed to his Works. Biog. Brit. 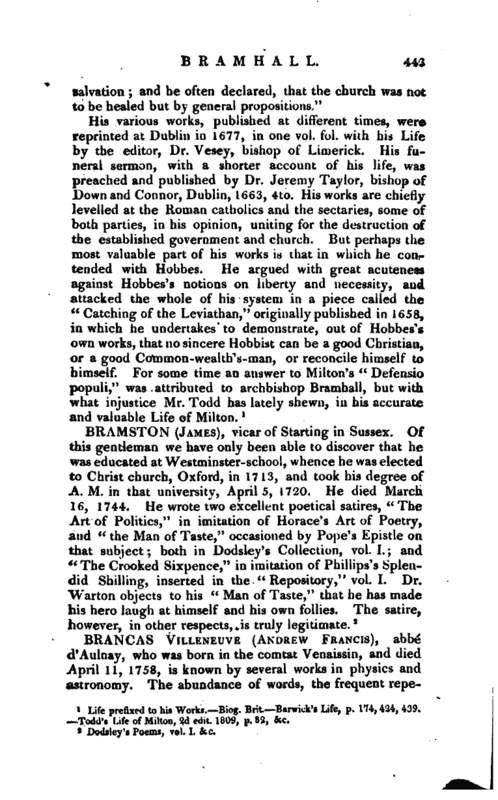 Barwick’s Life, p. 174, 424, 439. Todd’s Life of Milton, 2d edit. 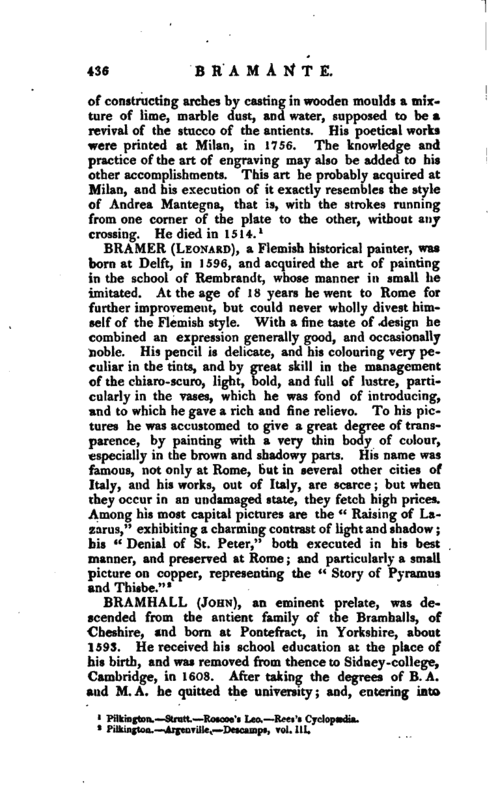 1809, p. 82, &C.